Quickly and easily convert a compact refrigerator or chest freezer into an impressive two product homebrew beer dispenser just in time for your next barbecue or pool party with the Kegco Ultimate Homebrew Two Faucet Tower Kegerator Conversion Kit! It features a 3" diameter stainless steel draft tower that makes it perfect for outdoor applications. 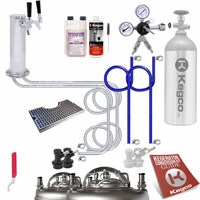 Like all of Kegco's conversion kits, this kit is made up the highest commercial grade quality components, including an intuitive dual gauge regulator and your choice of ball lock or pin lock keg couplers. We've even included a stainless steel drip tray, 32 oz. bottle of beer line cleaner, 16 oz. bottle of Star San sanitizer, and a faucet brush for hassle-free cleaning once your guests have all gone home. To guide you through ever step of the conversion process, every kit comes complete with detailed instructions, and our helpful product specialists are available at 1-800-710-9939 for troubleshooting. Comments: Great product! The only thing I would change would be to include 4" screws for the tower, the 3" screws included were not long enough to go all the way through the lid of the freezer I used, but that's a minor issue that only cost $3 to fix. Comments: This is really easy to install. The only thing that is not easy is that they make this for both commercial and home brew kegs, but they don't supply enough clamps for the home brew application. Comments: Quick delivery. Easy setup. Comments: I just finished building the kegerator. It looks really good and sturdy, but I haven't actually used it yet. I think it will work great. Everything I got was as advertised and arrived quickly. Only complaint is I got the cleaner pump with this package and since I had to cut the beer lines for the ball lock couplers the pump is now useless. Not sure why it is sold with this...I called Customer Support twice and they were available and helpful.